To see this amazing guy in action, check out this video from a very creative geocacher! It is a new look for the Cache Hunter! 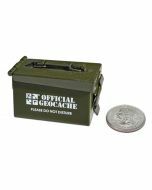 This ultimate geocacher comes with custom designed accessories including a logbook, a cache container, and a Geocaching back pack! Also included is a stand, and a Trackable Brick! The brick features the Geocaching logo on one side, and has a unique tracking code of the other, making it fully trackable at geocaching.com. 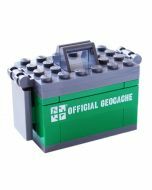 This is an amazing item for any geocaching collection, or Kragle the Cache Hunter to the Trackable Brick and send him out to hunt caches throughout the world! The Cache Hunter is a standard figure, approximately 1.75 inches tall. The brick is a standard 2 x 4, measuring approximately 1.25 inches x 0.625 inches.